Looking for the Wednesday Wandering? Page back to go forward… That is, to take a look at the stories that come before the stories, also known as prequels. Then join me in helping explain to Alan the mysteries of tipping. JANE: As we discussed last time, the Olde English custom of the Christmas Box seems to have died out in England and her Commonwealth. That is, except in the former British colony now known as the United States of America. Here tipping is alive and well – and stretching octopus-like tentacles further and further into various areas. Tipping even persists outside of the holiday season. ALAN: In New Zealand and Australia we almost never tip anyone for anything so I find the whole practice quite bewildering. Can you tell me how it works? JANE: Well, I’ll do my best but, I admit, I’m far from being an expert. At some point, we’re probably going to need to enlist our readership to fill in the appalling gaps in my knowledge. ALAN: OK – but before you start, let me tell you my Harlan Ellison story. He was a guest here at a New Zealand convention and, as one does, we took him out for dinner at a nice restaurant. The food and the service was first class and Harlan was a wonderful dinner guest. A fine time was had by all. He raced back into the restaurant, pulled out his wallet and started handing out money left, right and centre to the rather bewildered staff who really didn’t understand why the mad American was being so generous. JANE: That’s a lovely story. It’s nice to have a Harlan Ellison story that shows him in a good light. I was lucky enough to meet him when Roger was still alive. They were friendly and so I saw Harlan being warm and affectionate. That speaks volumes, I think. Let me lay a foundation before getting to Christmas Tips. If you and Robin were to come to the U.S., one of the places you’d be most likely to encounter expected tips is – as your Harlan Ellison story shows – in restaurants. Indeed, it’s so expected that – except for a very few of our fifty states – the minimum wage for wait staff is adjusted with the expectation that they will make up the rest in tips. Knowing this, it’s the one place I always tip. The usual percentage is fifteen to twenty percent of the total bill before tax, although you can tip less or more if you feel like it. JANE: Now, now… Frankly, I don’t see this as socialist, I see it as the nasty capitalist owners finding a way to not pay the worker a living wage and instead passing it on to the poor customer. But we should probably avoid politics! Wait! Do you guys use that term? ALAN: No we don’t have that expression. I’ve never seen a bus pull up to disgorge or pick up passengers at a table in a bar. What an intriguing notion. Do you have to take a special driving test? It must take a lot of skill to manoeuvre such large and ungainly vehicles around such relatively tiny rooms. JANE: Your interpretation makes more sense than the actual term. However, the reality is less dramatic. Bussing a table means clearing it of the dirty dishes and suchlike. The term probably comes from the cart used to carry the stuff back into the kitchen, which was apparently referred to as a bus. Originally, this job was one for males, probably because of the muscle involved, so the term was “busboy.” However, by the time I was doing my job, females did it, too, so the term didn’t really apply and we were usually just told to “bus” the table. ALAN: Ah! Winston Churchill would have loved to know that. In his autobiography he records his puzzlement when first introduced to Latin declensions at school. He was being taught to decline mensa (a table). He queried the necessity for the vocative case (also mensa) and was informed that it translated as “O table…” and it should be used when addressing the table. He asked why he would ever want to address a table; a perfectly reasonable question to my mind. However his schoolmaster was not sympathetic and threatened him with a beating if he didn’t get on with the lesson. But if you were going to kiss a table, presumably you would need to address it in the vocative in order to ask its permission first. After all, if the kiss wasn’t consensual, you could get into a lot of trouble! JANE: You are completely insane, Alan. I like it! I’m immersed in a binge of Churchill biography now and this anecdote seems perfectly in character. Anyhow, bus people don’t usually get tipped (although occasionally a customer would be expansive) and so the wait staff would hand out a portion of what they were given. ALAN: Something I’ve seen a lot of in American movies is people in bars and restaurants simply leaving a handful of cash on the table and then walking out. Does that actually happen? How do they get a receipt? Why don’t people on other tables reach out and pocket the money? JANE: Good to know. I guess it’s an honor system at work. It does get abused, I’m sure. However, in my experience, it’s more likely to be abused by the wait staff than the customers. I’ve seen wait staff assume that any cash they’re handed that’s over the amount of the bill is the tip. Sometimes they get away with it, because the customer is too embarrassed to correct them. 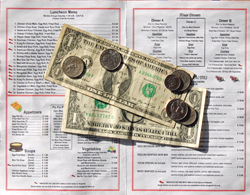 In the U.S., being a “big tipper” can be a way to demonstrate wealth. I’ve seen people deliberately over-tip to show off. ALAN: I’d find that so embarrassing. Showing off is quite foreign to our culture and anyone who did that kind of thing here would attract disapproving stares and low mutterings. Anyhow, when the restaurant was really busy, the bartender was given one bus person to wash glasses. I was really good at this because my dad was a demon for clean, unspotted glasses, so I often got the job. This was a job to envy because the split of the bartender’s tips was usually much better than that from the waitresses. You also didn’t need to juggle huge trays filled with dirty dishes, something I was never very good at. ALAN: How does tipping work with self-service restaurants that provide a buffet? JANE: If everything, including drinks, is self-service, then no tip is expected. If the wait staff brings drinks or items not on the buffet, then the usual tip amount is ten percent. It’s also usual to tip someone who delivers take-out to your house. There’s no set amount for this, though. In this case, it’s really a courtesy for the assumed courtesy of the delivery. It just occurred to me that we’ve focused completely in tipping in the food industry. That last bit about delivery does take us into how tipping is charged in the service industries. Would you be interested in continuing with that next time? ALAN: Definitely! I’m feeling more and more puzzled by this phenomenon. This entry was posted on January 2, 2014 at 1:00 am and is filed under Thursday Tangents. You can follow any responses to this entry through the RSS 2.0 feed. You can leave a response, or trackback from your own site. There’s also the tax-evasion element to tipping – being cash, most wait staff forget to declare it on their taxes (although technically you’re supposed to). There’s a third approach to tipping you didn’t cover, between the “voluntary” (but expect a filthy look at the least if you didn’t) and the “what’s a tip?” – the mandatory (and included as a line item on the bill, but often *not* included in the menu price) 10-20% service charge. Not often seen in bars and restaurants in Canada and the US, unless you’re booking a large party, but quite common in some parts of Europe and Latin America – in some places it’s so common and expected that it’s just assumed, some places will indicate (often in very small print) on the menu that such a fee will be added to your final bill. I’d always figured that if the wait service “kept the change” of the bill as their tip, we’d been such discourteous guests that they simply wanted us out of there, so I never go to these places again. If they thought it meant something else, then the owner has a problem too. The tip is as much about communication as anything else. I’ll occasionally leave the bill, plus a tip, and then leave with the receipt (how else would I know how much to pay?). It’s easier to do when the bill plus tip comes out to a nice even number, and it’s also a useful practice when I’m in a hurry and the waiter is not. One classic insult in the US is to leave a penny tip. I think I’ve done that once, maybe twice, and the service has to be truly atrocious. Nowadays, a negative review on social media is far more effective feedback. There’s only so much one can communicate with a tip. Tipping of service people is so deeply set in this (USA) culture that, when I worked retail, in the large item pick-up area, customers would try to tip us for loading and tying down items in/on their cars. This was specifically banned by store policy, enforced by undercover ‘sting’ operations. I had folks actually try to stuff cash in my apron, in a sort of reverse pick-pocketing. one variation i’ve heard about is that tips are pooled and shared with the kitchen and scullery staff, on the grounds that they have contributed as much to the customer’s pleasure as the waiter. In the US, Five Guys does the tip pool thing. And Caesar’s (casinos) has a similar method of pooled tips. One thing people frequently mistake as a service fee is the “Delivery Charge” assessed by the large pizza places. If the driver gets any of that over minimum wage it is a fraction at best. And some states allow drivers to be paid as tipped employees, at least as long as they are on the road. The other side of the bill at a restaurant can be a foreign land for some. I have also had the forced tip problem at big box stores. “I’m sorry sir, its against policy to accept tips.” Just won’t cut it for some people. Spent all my life as a service industry worker. Back in the ’60s, a friend of mine was carrying a large amount of change and left much of it on a city restaurant table for a tip. His server made a disparaging remark about the lack of a significant tip, prompting my friend to gather up his change and leave a paper money tip — much less in size than the change would have been. Re Harlan: Sometimes I think much of his bad-boy image is deliberate. The only time I ever observed him, at the 1970s WorldCon in D.C., he would say something outrageous or insulting to someone (“Can’t you see I’m busy, kid?”) and then, when the person was gone, grin to himself and say something self-deprecating. But I, too, have heard more positive than negative stories about him. This is fascinating… I hope Alan is taking notes!